Welcome to Pine Cone Ridge!! Blue Ridge cabin with mountain views, a meandering creek below all in the middle of the Rich Mountain Wilderness in the heart of the Aska Adventure Area. Located on 3 acres and surrounded by 10-15 acre tracts; gorgeous and like new, this cabin was built in 2008. Only 10 minutes to Historic Downtown Blue Ridge and Lake Blue Ridge Marina- Toccoa River. Hike out your door into the United States Forestry Service with marked hiking and mountain biking trails. Hike to a near by waterfall or rent a canoe, kayak or tube and float down the Toccoa River. Its all right here! Historic Downtown Blue Ridge has upscale boutiques and wonderful unique shops with fine wine and rare books, spiritual and Indian shops, upscale or casual restaurants, a vintage Drive in theater. The Blue Ridge Scenic Railway is even located right here. Come see why Blue Ridge is one of the top ten travel destinations in the U.S.! What makes this cabin special is Location Location Location! You will feel like you are miles away from it all when you arrive but in reality you are just a few short minutes to everything that the Blue Ridge area has to offer. Cabin has beautiful Rustic craftsmanship such as twisted Mountain Laurel branches on the stair railing and in the cabinetry. The cabin has pine walls, maple floors and pine ceilings with upscale fixtures and decor to make this a modern rustic retreat. Stunning suspended Glass lighted fixtures float above the River Rock Bar. Recessed lighting and rustic vanities in the bathrooms. French doors throughout lead you to decks on both levels that face the Mountains, the creek below and forested views around you. Completely secluded and private with no neighbors. Cabin is two levels. Downstairs has a full finished daylight basement with a guest bedroom with a queen bed, a middle recreation room, a kids bedroom with bunk beds and a full bathroom. Upstairs has two bedrooms and two baths with the master on the main level, queen beds. Has a wood burning fireplace and an open kitchen, bar and dining area that adjoins the main living room. Has a large outdoor area with lounge chairs, picnic table and fire pit. Surrounded by a mature forest of Hemlocks, Mountain Laurel, Rhodedendrum, Hickory's, Oaks and Pines make this an scenic, peaceful mountain retreat in the heart of the Blue Ridge Mountains. Cabin has Wireless Internet, Satellite TV and a DVD player. Games for kids. Phone in cabin for local calls only. Cabin sleeps 10 (in real beds). Snow and ice make it a different story. Keywords: Blue Ridge GA Vacation Rental, Aska Adventure Area Cabin Rentals, Mountain View Cabin Rental in North Georgia, Creekfront Cabin in Blue Ridge, GA, Cabin near historic downtown Blue Ridge, Private cabins to rent in the Blue Ridge Mountains, North Georgia vacation rental cabins, Blue Ridge, GA cabins for rent. 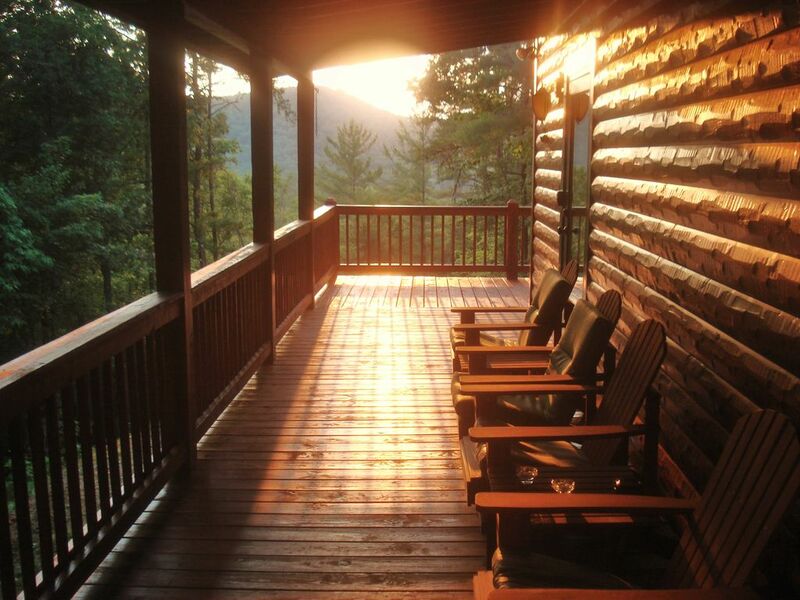 The peace and serenity of this cabin and its great location are what persuaded me to buy it for our family. It has already given us opportunities to get together as a family that we wouldn't have had otherwise. Even though I live far away, it's still my favorite place. It's a great family cabin with room for all and endless fun activities in the area. It's a great family cabin with room for all and endless fun activities in the area .....fishing, tubing, river rafting, boating, swimming, hiking, and just hanging out. lt's close to everything........rivers, Lake Blue Ridge, restaurants, and shopping, but you feel like you have the woods to yourself when you're there. It's a great family cabin with room for all and endless fun activities in the area. We take pride in keeping our cabin pretty, well-stocked and clean, to ensure that our guests have a comfortable, relaxing stay. The great outdoors at your finger tips, close to everything! A creek for the kids and woods to explore. Deer and other wildlife have been known to drop by also. You can choose to have a quiet weekend or one filled with adventure. The cabin was very nice and cozy comfortable! This is a beautiful home. Not very big but just right. We shared this cabin with our family of 10. Our grandchildren had a great time playing foos ball and just loved the downstairs. There was lots of room to play. Then we explored the surrounding woods and the creek. We played in the creek even tho it was cold! Brr.. We enjoyed the fire pit and we cooked every meal in the kitchen. We hoped for wildlife to wonder by and a skunk decided to join us on the last day! 😬� 😂�. Maybe next time we will see a deer. Incredible Spot to Get Away with Friends! This house is amazing! It was the perfect space for 12 people to hang out and not feel crowded! The scenery around the house is beautiful and it was an easy drive from Atlanta. Thanks for having us! Really nice cabin. The owners are friendly and provide all information. Peaceful place to rest and wnjoy with family or friends. Great & Beautiful cabin, steep hill. Everything was nice. My husband and I brought our two daughters, their husbands and our four grands. It was the prefect size. The grands loved the bunk room (they got to all be together)! The house was cozy and inviting and grounds were beautiful. We felt like we were all alone. Couldn't see another house or hear any other cars. It was very peaceful and helped us reconnect. No complaints from the Yates,Blakely and Bush families. We had 10 adults in the cabin and never felt crowded. Perfect secluded cabin that was close enough to explore downtown for dinner. Secluded, but you could find white-water rafting, kayaking, tubing, water-skiing, swimming, hiking, mountain biking, hiking, fishing and hunting, all within a 10-30 minute drive.